Hey, JOY Journal friends! Bringing over another piece from the spirituality series I’m doing for an e-magazine. It features Christian traditions dating back to Byzantine times that believers from more contemporary traditions may enjoy reading about. Blessings! The Rev. Demetrios Tsikouris stands in front of St. John’s holy sanctuary, the part of the church where the priest’s preparation service for the Divine Liturgy takes place and the communion items are stored. 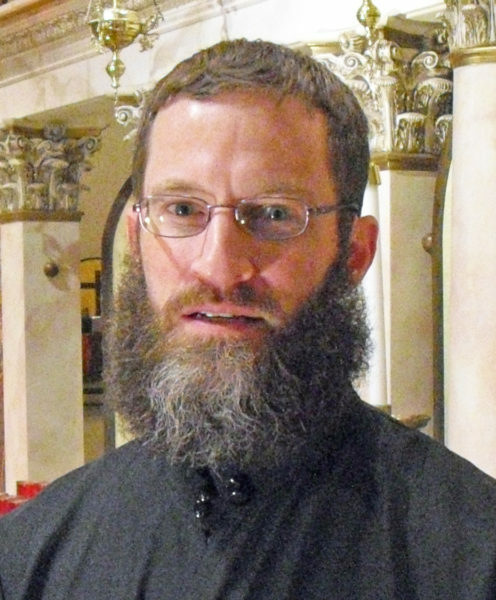 Editor’s note: As part of a continuing series on how Wheeling residents express spirituality, today’s post features Orthodoxy, an ancient form of Christianity whose worship has remained virtually unchanged since the Byzantine era. 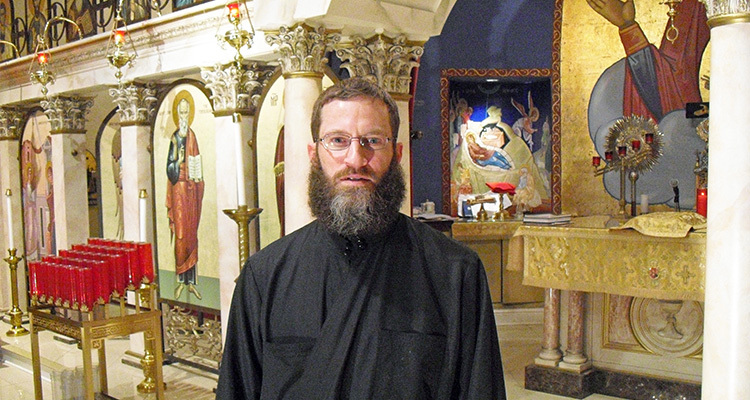 The actual words might be in Greek or Russian or Arabic, but right here in Wheeling, Father Demetrios Tsikouris is quite comforted by that kind of continuity of spirit. Do words of antiquity fly in an America that seems increasingly geared to the uber-contemporary worship favored by mega churches? Tsikouris, who left a professorship of pharmacology at University of Pittsburgh to pursue the priesthood, says they do. St. John’s is home to not only the descendants of Greek immigrants and Orthodox Christians from other parts of the world, but to newer converts who have been drawn by that very history and spirit of the sacred. The converts include Shelly, his wife and mother of the couple’s four daughters. She grew up in a Baptist family. So, the tradition goes on. Incense instead of coffee in the pews. Hand-held liturgical books (written in both Greek and English) instead of words projected onto a drop-down screen. Byzantine-style chanting and intonation instead of electric guitars and drums. The latter, in fact, seem almost laughable in a church that glows as if carved from ivory and carries a hint of spikenard incense from Sunday service. The Rev. Demetrios Tsikouris, pastor of St. John the Divine Greek Orthodox Church of Wheeling, holds the congregational version of the Divine Liturgy. These scripture readings and prayers — which are mostly sung or intoned in the Orthodox tradition — have changed little in more than 1,600 years. Locally, the liturgy is spoken mostly in English, but there is still a “sprinkling” of Greek used on behalf of congregants who speak it. The liturgical books are printed in both languages. And, while St. John’s is officially a Greek Orthodox church, it serves congregants who hail from other parts of the Orthodox world and converts who have no history in this Christian tradition. Tsikouris is of both Greek and Ukrainian heritage. And, forget in-and-out timing, he added. The typical Sunday Orthodox service lasts about 90 minutes. Certain services of Lent and Holy Week blossom to as much as two-three hours long and six times per week as Easter nears. This adherence to Orthodoxy or, literally, “proper glory” is far from grim, however, he added. He said services have a big dose of joy. He particularly enjoys worship during Lent, the season of reflection and repentance that precedes Easter, even though that much chanting and intonation takes its toll on his voice. “They don’t realize that I’m dying by the end of the week,” he said, both laughing in anticipation of the coming season and noting he actually prefers the lengthy Lenten prayers written by St. Basil the Great. Left, the priestly copy of the Bible is covered in gold plates and stored under a golden cloth at the foot of an ornate cross when not in use. 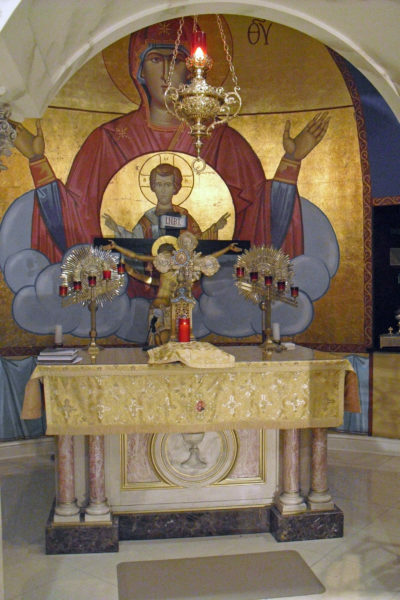 Tsikouris said the embellishment reflects an Orthodox tradition of mystically replicating worship in heaven’s throne room on earth.Right, communion supplies are equally ornate. For all its commitment to antiquity, Tsikouris explained that Orthodoxy shares certain elements with the Roman Catholic Church and other liturgical forms of Christianity. Indeed, he said, Orthodoxy and Catholicism could be said to be Eastern and Western expressions of Christianity’s shared first millennium. Both expressions revere communion, or the Eucharist, literally “thanksgiving.” Tsikouris pronounces it in Greek, a whispery eff-kar-EES-tee-uh that still manages to echo around the church. Services and priestly customs such as facing the altar rather than the congregation during parts of the liturgy also have commonalities, particularly if looking at Catholicism prior to the second Vatican Council, he added. There are critical differences, however. Tsikouris said disagreement between Eastern and Western Christianity ranged from authority structure (Orthodoxy has a council of bishops rather than a pope) to doctrine (such as one split-provoking difference being the procession of the Holy Spirit as worded in the Nicene Creed). When Western crusaders sacked Constantinople, the seat of Eastern Christendom, that pretty much completed the schism. “The ancient apostolic church that’s been handed down to the saints, unadulterated, for hundreds of years. This is how the church sees herself,” he said of ancient and modern Orthodoxy. Orthodoxy is also known for iconography rather than statuary. Tsikouris said icons can be painted, done in mosaic tiles or carved into wooden panels. The 106-year-old St. John’s church was recently redone with replicas of paintings. Older icons in the building, such as this image of St. Bartholomew, right, that is inside a window, are done in Western style, he noted. Newer icons, such as this image of a white-haired St. John, left, hark back to the Byzantine style that is more traditional to Orthodoxy. And, if you believe you’ve got it right, why would you change it, he explained. The Divine Liturgy, for example, has been around, virtually unchanged, for more than 1,600 years — before the church began to fracture. Orthodoxy today is unified globally on doctrinal and authority-structure issues, Tsikouris said, but does have some regional variations. For example, all Orthodox services are mostly sung or intoned (another difference from Roman Catholicism), but Russian tradition tends to follow four-part harmony rather than the chant style preferred by other church regions. Regional differences aside, Tsikouris said it always comes back to the actual words, the Divine Liturgy. And the Orthodox people will sing back in their many languages: “Mercy and peace, a sacrifice of praise.” As they always have. All the liturgical splendor of the holy sanctuary is normally gated when not in use. I admire much of the the Eastern Church. Though not raised with liturgy, I have been profoundly touched by the Holy Spirit in liturgical worship because it overwhelmed me with truth after truth. the kind of things that one can easily overlook when too busy. Thanks for sharing the article! You’re welcome — and thanks for reading. This tradition of worship is also very different than my own experience, but I was really touched by the Orthodox people’s reverence for God’s Word and the sanctuary. A lovely, sensitively written article. Thank you. Orthodoxy is very different than my own Christian tradition, but is quite beautiful in its reverence. I had quite a few regular visitors from Russia on my old Blogger blog, but when I moved to WordPress most Europeans didn’t make the move across. Wondering if there’s a tech reason for that . Hmm. Christian is Christian, it’s the same Jesus.